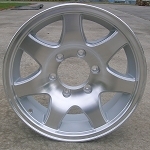 16" White Spoke Trailer Wheel. The exact size is 16" x 6" 6 lug on 5.5" bolt pattern. Center hole diameter is 4.25 inches. Max load is 3500 Lbs per wheel. Most common tire sizes mounted on this wheel are 235/85R16 and 235/80R16. If ordering center caps the size you would need is 4.25 inches.